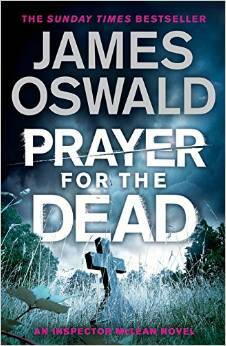 James Oswald's fifth book featuring Edinburgh Police Detective Inspector Tony McLean was really enthralling and I just could not put it down. The plot was very absorbing and I was truly gripped until the breathtaking conclusion. A local journalist, with whom Tony has had a lot of battles in the past, was unusually a great help in this particular case, as she was a colleague of the missing man and was able to point Tony towards possible explanations of the victim's behaviour. The plot, as in his previous story, seems to twist and turn all through the book which once started is very difficult to put down until the startling conclusion is reached. Tony McLean's subordinate detectives such as DS Ritchie and the one called DS 'Grumpy' Bob Laird are more featured in the investigations as time goes on. There is some very wry humour in the writing which adds to the charm of these books. Tony has a lot of problems with his superiors and with the usual crossover of other cases, that take what little time he has left over from his main investigation. There are also some problems in his personal life that distract him and there are references to cases that he was involved in in the past. Whilst it is helpful to have read previous books by this author it is not obligatory and the author makes sure that for readers who may buy his book on impulse, that the story is fully explained. This is the fifth book in the series about Tony McLean and the third one that I've read and I'm really enjoying them as they continue to remind me of Stuart MacBride and Ian Rankin. The character of Tony McLean is the antithesis of the usual copper in that he is independently wealthy, driving a large Alfa Romeo car and doesn't need to work but does so as he only inherited his fortune after he became a detective. The author of these cleverly detailed, plot driven books is unusual also, in that he writes an epic fantasy series, The Ballad of Sir Benfro on which he has three titles so far and he manages to combine his writing, oddly enough, with a full time job of running a 350 acre pedigree cattle and sheep farm in North East Fife. I loved PRAYER FOR THE DEAD and the previous ones I reviewed: DEAD MEN'S BONES and THE HANGMAN'S SONG. I look forward to reading his next one. If you want a thoroughly enjoyable and fascinating murder mystery with very strong characterisations then do buy this book. Very strongly recommended.